Which Penrith player was with a group of friends who were asked to leave a number of city establishments last weekend? There’s no suggestion the player himself did anything wrong but he may need to question the company he keeps. St George-Illawarra has secured the services of former player and first grade referee Luke Phillips, who had been on Penrith’s coaching staff for the last two seasons. Phillips was also on Brad Fittler’s staff for the recent State of Origin series. I’m hearing that Phillips felt under-utilised at the Panthers, which may provide a little bit of insight into the issues surrounding head coach Anthony Griffin at the moment. 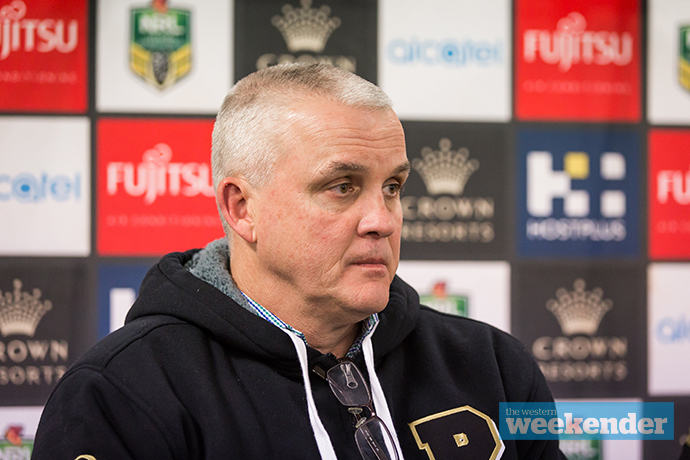 Did Anthony Griffin recently meet with another Sydney-based NRL club? It’s been hard to confirm the rumour but it’s certainly doing the rounds. Four-year-old Brax is the proud new owner of Penrith second-rower Corey Harawira-Naera’s footy boots. 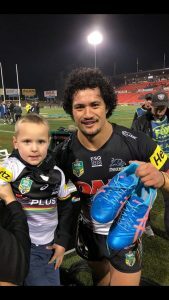 The young fan, who is part of a Panthers-mad family who are season ticket holders, asked the 23-year-old for the boots after the Panthers’ loss to Cronulla last Friday night. Not surprisingly, CHN was more than happy to oblige, making Brax’s day. Spotted: Injured Panthers fullback Dylan Edwards with his partner and young baby dining at Percy Plunkett last Thursday morning. Panthers and NSW forward Reagan Campbell-Gillard has turned to the Colonel for help in regaining the 8kgs of weight he lost after breaking his jaw against the Roosters last month. KFC’s popcorn chicken and mashed potato has been part of RCG’s diet as he attempts to get back to match fitness for his likely return in a few weeks. As a festively-sized gent, I can confirm the KFC should do the job in terms of weight gain. There’s Panthers fans all over the country including on the Gold Coast where the club held a special members event on Tuesday evening. The NRL squad mingled with members at the Kurrawa Surf Club, part of a big week of Queensland-based activities ahead of tonight’s game against Brisbane at Suncorp Stadium. Former Penrith captain Luke Lewis will retire at the end of the season. 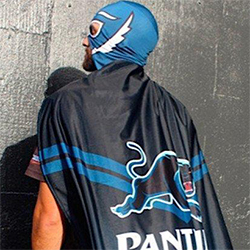 The 34-year-old, who has played more than 300 first grade games, is the last player of Penrith’s 2003 premiership-winning squad to exit the game. Talking of former Penrith captains, congratulations to Petero Civoniceva. It’s been confirmed that big Petero will join rugby league’s Hall of Fame this year, a well-deserved appointment.